Combine Fitness Testing: Who Stood Out? The last major activity at the 2015 NHL Combine was all that was left for the top prospects. It was the fitness testing. It was a chance for the prospects to show what they could do on a variety of levels. Among the tests performed were the standing long jump, the Force Plate Vertical Jump, the Bench Press, Pull-Ups, and probably everyone’s most dreaded test, the VO2 Max. Although the testing is not the end all to determine draft positioning, it certainly doesn’t hurt them if they perform well. So who stood out on Combine Saturday? We will give you five names that really left an impression on us. This will not include Jack Eichel. But it is worth noting that he was outstanding in his testing. 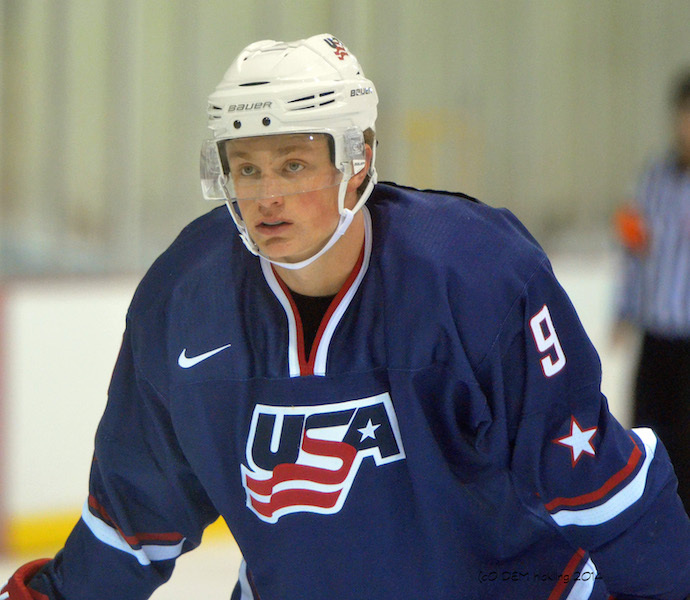 Eichel finished in the top 10 in several categories, including the Long Jump, Aerobic Fitness Duration, Pro Agility to both sides, Vertical Jump, and Bench Press. He is a phenomenal athlete. But we more or less know where he is going on draft night. Our focus will be on those lower in the draft that made a statement. We highlighted Greenway on our watch list prior to the fitness testing portion of the Combine. He dropped in the rankings quite a bit due to questions about his consistency. But after meeting with him and watching his testing, you cannot deny the power he has. Greenway finished tied for 4th in Wingspan, at 80.5 inches. Even more impressive, he finished in a big group tied for 3rd, with 12 Pull-Ups. Given his size, that is a major statement on how powerful he is. It will be interesting to see where he goes now. If properly developed, he could become an elite power forward in this league. Everyone wants that. The question is, will he find consistency in his game? It’s not often you see someone finish 1st in agility testing, from both sides. But that’s just what White did on Saturday. White was the only prospect to put in a faster time on Agility Right than Eichel, at 4.21 seconds. White then followed that up with a Combine best 4.34 seconds on Agility Left. He also posted Top 10 results on both the standing Long Jump and Vertical Jump. He is arguably one of the best two-way centers in this draft. Does this now put him in the 1st round conversation at the draft? White currently ranks 29th on Central Scouting’s list of North American skaters. Saturday’s performance certainly opened some eyes. Anytime you see someone perform an activity better than Connor McDavid, you take notice, especially if it’s one of McDavid’s strengths. Senyshyn posted a time of 4.42 seconds on Agility Left. He followed that up with a Top 10 on the Long Jump. Senyshyn’s stock has been on the rise since the midpoint of the season. He is currently ranked 38th on Central Scouting’s list, after being ranked 56th at the midpoint. Saturday solidified his place in the 2nd round. Why is this important? It shows how deep this draft really is. The 2nd round has a lot of talent in it. All of the attention is going to the top of this draft, and for good reason. But don’t sleep on those later on in the draft. A team’s success will ultimately be determined on how they do in the later rounds. OHL 66GP 26G 19A 45PTS (0.68 PPG) – Great mix of possession, speed and work ethic. Another player on our watch list was Erikkson Ek. He did not disappoint us on Saturday. Eriksson Ek posted very impressive results on the aerobics portion of the fitness testing, including 3rd overall on the VO2 Max test. We had our eyes on him due to his rapid rise in the rankings of European skaters. He went from 22nd to 4th overall on that list. Eriksson Ek was also amongst the last group of prospects to test. He still needs to fill out physically. But you can see why he is rapidly on the rise. He is listed as the highest ranking European center, and as the highest ranking forward from Sweden. He is projected as a mid-late 1st rounder. It will be interesting to see if he can continue the momentum he has started. To me, Blackwood was the most impressive prospect at the Combine, outside of Eichel. Just look at the different events he posted top 10 results on: Peak Power Output, Vertical Jump, Left-Hand Grip, Right-Hand Grip, and Long Jump. Blackwood showed us his strength and athleticism. Given the fact that Ilya Samsonov didn’t test, Blackwood made a strong case to be the first goaltender taken in this draft. He already has the size at 6’4″. He doesn’t have many flaws to his game given his age. Blackwood most likely goes in Round 2, but he won’t be available for long. He has nice upside. And now we wait. The NHL Draft is under three weeks away. How will everything unfold? How many trades will there be? Who will be the biggest surprises? Let the hype begin.